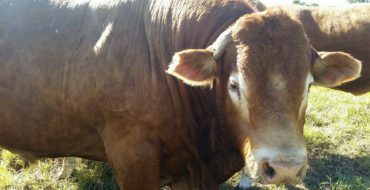 Elaboration on selling illegal grass fed/pasture reared/free range beef. A lot of butcheries are making claims that their beef is all of the above. The Agricultural Product Standards Act 1990 (click on the green, twice, to download the Act) states very simply that you cannot make any claim which directly or by implication creates or may create the impression that meat or a carcass is of a special or particular quality other than a characteristic referred to in these regulations, may not be marked on the container of meat or stamped on a carcass. The relevant sections of the Act are 3 and 19. Our global warming reversing beef does not fall foul of these regulations as we have trademarked our protocols with SAMIC, the Red Meat Industry policemen, and accordingly our beef is rollermarked as per the photo below. Our rollermark is SPIERPR for Spier Pasture Reared. Our protocols are on the SAMIC website. Have you seen the rollermark on your so called free range/grass fed/pasture reared beef? Can you trace that beef to the farm where it was raised? If it is not rollermarked with a SAMIC registered mark then it could come from your friendly local feedlot. I also have a second trademark registered. It is called Cape Veld Beef. More information on recent activity on this label is here. We have our own butchery on the farm now. Details about available produce is here. You can also click on BUY MEAT at the top of the page. Update on our CLA in beef trial.Free choice mineral lick – Balancing our soils biologically as opposed to mechanically. It will also have a yellow color- not the chalky white color of store bought beef. Also, meat bought in the grocery store will have more moisture, or water, because it is wet aged, vacuum sealed and shipped to the stores from the huge processing plants. 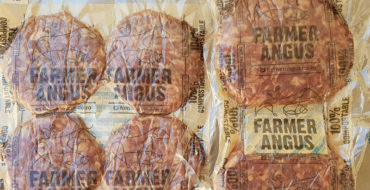 obeorganic.com, try this..
Hello Farmer Angus! Hope you guys are having good weather there. I was just checking out your blog again and seeing what was new. Good article! A lot of people are now coming to me looking for good grass fed beef in Gauteng but we don’t have many. Pity. Please tell me when you expand to this side 🙂 People are also looking to alleviate health conditions such as MS with better nutrition. In a way, we eat what our animals eat!